Click. Pray. Love: What a weekend! Friday evening I met Sam for dinner before going to Tropicana Field to watch the Rays play the Cleveland Indians. For those of you who don't know, I am not a baseball fan. Mainly due to the lack of knowledge and the boredom that occurs while attempting to watch baseball on TV. However, I have married into a family that loves and I mean LOVES baseball. With that said, I must admit I am beginning to enjoy attending and watching Rays games so much that daily I ask which team won and the score. I did not feel this way on Friday night. By the forth inning the score was 7-0 Indians. Sam and I had decided we would stay for one more inning and if there was no change we would head home. 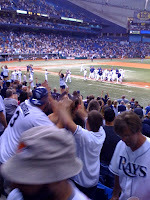 Much to our surprise and excitement the Rays scored 3 runs in the bottom of the fourth. The Rays fought their way back with a tie game at the bottom of the eighth. They were able to hold off the Indians in the ninth and first to bat for the Rays was B.J. Upton. As Sam says, "He hasn't done much this year." I nod in agreement, like I know, but I mean I am becoming a knowledgeable, devoted, loud, supportive fan. All I know is that I was excited!!! Not as excited as the "nail bitters" I have experienced in Rupp Arena, but I was excited. I can't remember exactly how B.J. 's batting went, but what I do remember is that he HIT A HOME RUN! RAYS WIN! RAYS WIN!! If I believed in good luck charms, I would say I am one......for the Rays. I have attended two games. They have won both. The first, Zobrist hit a Grand Slam. The second, they win in the bottom of the ninth after the biggest comeback in Rays history. The final score 8-7 RAYS!! During the game, Sam looks at me and says, "Give this guy a Gator Chomp." (For those of you who don't know, Florida Gator fans are known for their annoying little Gator Chomp that usually occurs when taunting another team or singing their school song.) What do I do? I immediately raise my arms and give two VERY LARGE Gator chomp. Sam begins laughing hysterically, I look up and what do I see? A man standing in front of me, with a maroon and gold shirt that has an Indian with a tomahawk, smiling. It only took me a millisecond to realize Sam had encouraged me to taunt a Florida State fan. Now I am laughing hysterically and the smiling man sweetly says, "You didn't just do that." I couldn't tell if he was being serious or joking along with us, but if our crying laughter was any indication he knew we were joking. 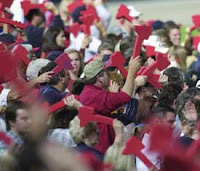 Later in the game, his wife walked out into the isle and said, "He told me to give you one of these" as she waved her arm up and down in the motion a tomahawk makes. We all laughed and the innocent UK Wildcat fan (me, me, me) knew the rivalry was a great joking opportunity when we were all cheering for baseball, but was certain the outcome would have been different if we were at a football game. We didn't get home from the game till 12:30 a.m., but knew we had an early morning. Sam's company was sponsoring a deep sea fishing trip Saturday with the departure time set for 8 a.m. Sam and I awoke in plenty of time to drink coffee, chat with the family, and eat breakfast. We only live about 8 miles from the Marina, so we thought we were OK on time. I guess we forgot that we live in FLORIDA: the RED LIGHT, SLOW DRIVING, capital of the world!! He dropped me off at the Double Eagle Marina to get a parking pass and................OH NO the boat had just left the dock. The nice, young woman behind the counter said, "They just left. They will come back and get you, no problem." The boat circled back around and we boarded with a nice welcome, OVER THE LOUD SPEAKER. We had a fun day out to sea. However, I feel bad that Sam will no longer be known as the new guy at work, but the late @$%K*L#! (insert funny, obscene comments that I can't come up with) guy. I would like to look at it as the "we won't soon be forgotten" incident. Another Side Note: When preparing for bed on Saturday night Sam said, "Don't look at this spider." Hearing, "Look at this spider," I turned around. OH MY GOODNESS!!!!! The SPIDER was huge, I mean HUGE, the diameter of a baseball, HUGE. I had a minor melt down that included freaking out over sleeping with spiders that lead to tears and my desire to go home. Thankfully, it only lasted about 5 minutes. Hey that's what I call success! My melt downs are getting shorter and less frequent. Sunday, we were off to the church around 8:15 a.m. We have been attending a church in South Tampa, so it takes us about 45 minutes to drive there. We have been to South Tampa Fellowship about 4 times and have attended one Sunday school class. There was one other Sunday school we wanted to attend, the Young married class, before we made a decision about our involvement at this church. Sunday school was at 9 a.m with church scheduled for 10:30 a.m. When we arrived there were only a few people in the class, but by the end there were four other couples, the teacher and us. Everyone was sooooo friendly. They told us more about the area, more about the couples who are involved in the class, more about outside activities, and more about the church. We were very encouraged. I just kept smiling and saying, "We are going to have friends. I really think these people could be our friends. It is so great to have conversation. We are going to have friends again." I have really never doubted that God would provide us with a church home and/or friends, but sometimes it seemed so far away, so out of reach. At this point, I am very encouraged and feel good about what lies ahead. To polish off a fun, entertaining weekend we rode our bikes 20 miles for me and 22 miles for Sam. Sam likes to ride out to Clearwater beach for more of a challenge and I like the view, so I tagged along. There are two tall bridges that he rides up and down several times, as they are the closest place to ride for hill work. Then we ran, 2 miles for me and 3 miles for Sam. Maybe, I can do a triathlon!?! I guess we'll have to wait and see. Oh Amber...you always make me laugh. It is definitely hard to move to a new place without friends. We didn't have any friends our age for the first four or five months (mostly just spent time with his students). Then we met our now best friends. And we didn't feel really connected with them for a good three or four months more. God does provide! It is just hard when you come from a place you have lived for so long (and love). I miss Kentucky too...but I can't imagine not knowing our friends here. I miss you friend! First of all, your gator chomp story is hilarious! I can definitely picture that like I was there, and am still laughing about it. It sounds like you are enjoying your time in Florida and adjusting well. I am so thankful God is providing you with potential friends! I have been praying specifically for that for you all! Miss you.